You have been asked to run a journal club in your department about heart failure. You followed the key steps of Evidence-Based Practice that you have learned: formulated a clear searchable clinical question, searched the main databases and came across this recent hypothetical article. In this hypothetical article, the authors conducted a randomised controlled trial to investigate the effectiveness of a new treatment for improving the survival of patients with heart failure. A total of 105 patients were randomised to the treatment group and a total of 106 were randomised to the control group. The primary outcome was the overall survival rate. (Blue line represents treatment group and green line represents control group). What is Hazard Ratio? What do the authors mean by 95% confidence interval? How can you interpret this information? How can I read the figure? What are the main findings I can learn from this figure? 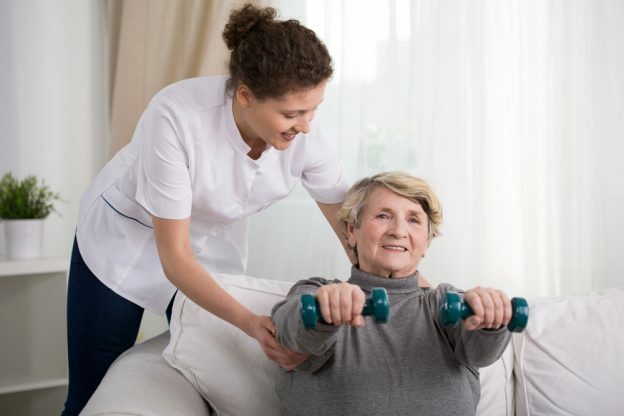 How can I convey this information to my patients? In this blog, you may find the answers to these questions. What is a Hazard Ratio & what are Confidence Intervals? 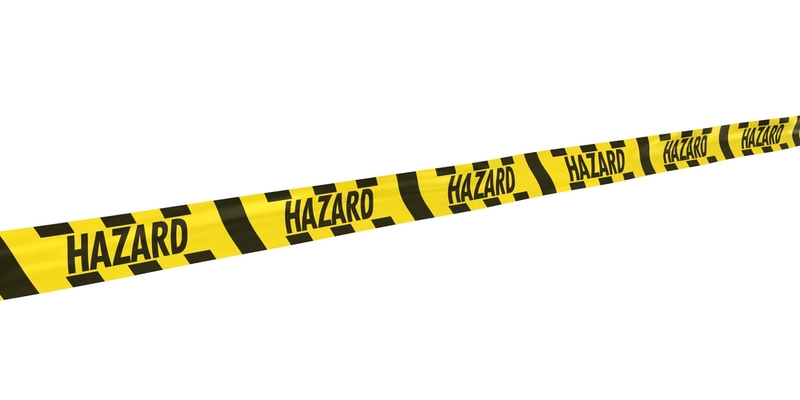 Hazard ratio (HR) is a measure of an effect of an intervention on an outcome of interest over time. Hazard ratio is reported most commonly in time-to-event analysis or survival analysis (i.e. when we are interested in knowing how long it takes for a particular event/outcome to occur). Hazard represents the instantaneous event rate, which means the probability that an individual would experience an event (e.g. death/relapse) at a particular given point in time after the intervention, assuming that this individual has survived to that particular point of time without experiencing any event. Confidence Interval (CI): is the range of values that is likely to include the true population value and is used to measure the precision of the study’s estimate (in this case, the precision of the Hazard Ratio). The narrower the confidence interval, the more precise the estimate. (Precision will be affected by the study’s sample size). If the confidence interval includes 1, then the hazard ratio is not significant. HR = 0.5: at any particular time, half as many patients in the treatment group are experiencing an event compared to the control group. HR = 2: at any particular time, twice as many patients in the treatment group are experiencing an event compared to the control group. 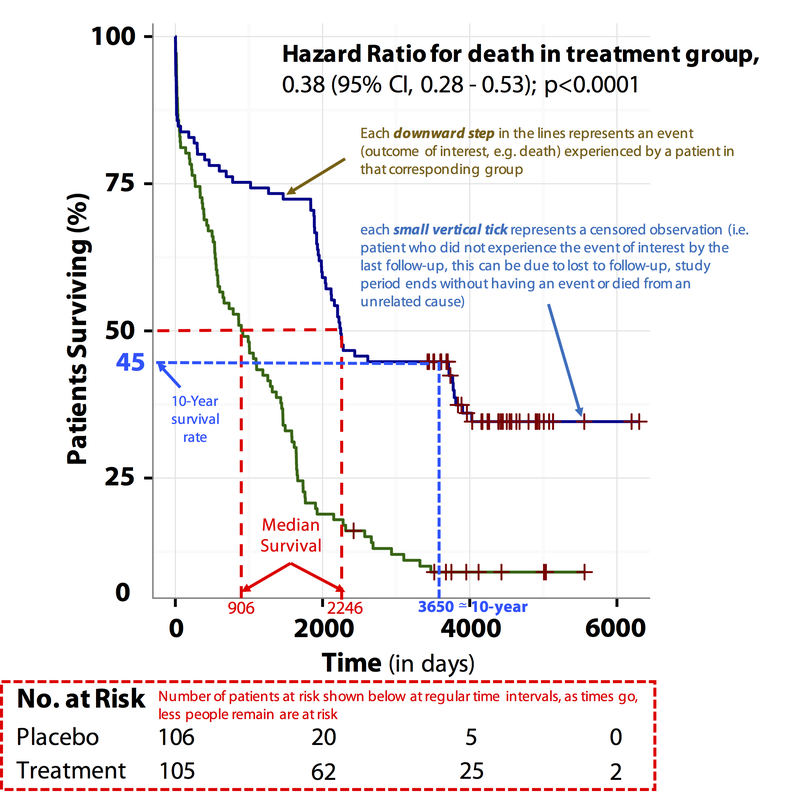 In the results, the authors reported that the hazard ratio for death with the new treatment = 0.38 (95% CI, 0.28-0.53; P<0.0001). What does that mean? Patients in the new treatment group at any time point during the study period were 62% less likely to die than patients in the control group, and we are 95% confident that the true value is lying between 47%-72%. (i.e. we are 95% sure that patients in the new treatment group were between 47% and 72% less likely to die than patients in the control group). Kaplan-Meier curve: is a graphical method of displaying survival data or time-to-event analysis (i.e. the proportion of patents surviving against time) and is usually drawn as a step function. The horizontal axis represents the time of follow-up starting from enrolment while the vertical axis represents the estimated probability of survival. Each downward step in the lines represents an event (the outcome of interest, e.g. death) experienced by a patient in that corresponding group, while each small vertical tick represents a censored observation (i.e. a patient who did not experience the event of interest by the last follow-up. This can be due to being lost to follow-up, the study period ending without an event or because the patient died from an unrelated cause). The numbers of patients at risk at regular time intervals is shown at the bottom of the figure. With time, fewer people remaining are at risk. This graph also allows you to detect the progression of the condition (e.g. early postoperative mortality or a serious adverse event caused by the drug), by the presence of a notable sudden steep drop in survival at a particular time point. 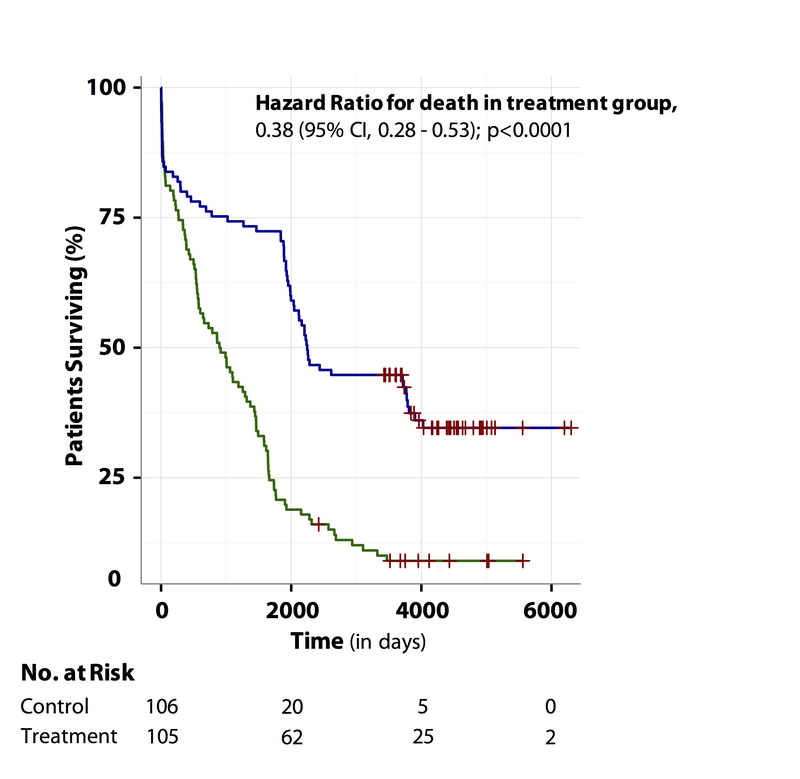 Median survival: half of the patients in the treatment group have survived for 2246 days (median survival rate) compared to 906 days in the control group. Difference in median survival: On average, patients in the intervention group survived for 1340 days longer than patients in the control group (2246 – 906 days). Proportion surviving at a specific time point: about 45% of patients in the treatment group have survived for 10 years (3650 days, i.e. 10-year survival rate). Another way of saying this is that about 45% of the patients in the treatment group have not experienced the outcome of interest (e.g. death) after 10 years of follow-up. Hazard ratio is frequently interpreted as risk ratio (or relative risk), but they are not technically the same. However, if that helps you to understand hazard ratio then it is OK. But keep in mind HR is not RR. One of the main differences between risk ratio and hazard ratio is that risk ratio does not care about the timing of the event but only about the occurrence of the event by the end of the study (i.e. whether they occurred or not: the total number of events by the end of the study period). In contrast, hazard ratio takes account not only of the total number of events, but also of the timing of each event. Spruance S.L., Reid J.E., Grace M., Samore M. Hazard ratio in clinical trials. Antimicrob Agents Chemother 2004; 48: 2787–2792. I would recommend to add that the intervention reduced the risk of death by 62% (1-(0.38)*100) when compared to the comparison group. we are 95% confident that the true value is lying between 47%-72%. (i.e. we are 95% sure that patients in the new treatment group were between 28% and 53% less likely to die than patients in the control group. Wouldn’t it be (i.e. we are 95% sure that patients in the new treatment group were between 47% and 72%. less likely to die than patients in the control group? You’re quite right. Apologies, this was a mistake in the publication process and was not Loai’s error. It has now been amended. I have a question related to this topic, please. I have 4 groups (let’s call them A, B, C and D) and I am given hazard ratios with confidence intervals for groups B, C and D with A being the comparator. What I really want to do is combine A, B and C ‘s data and have that whole group compared to group D. Possible? How? HI there, thank you for the explanation it was super helpful. If I had the average age for the treatment and control group, would it be possible to “translate” Hazard Ratios in years of life expectancy following treatment relative to control? Very nice explanation on HR. The best I’ve ever seen and much appreciated. I’m sharing with my staff! Hazard ratios are by definition time-dependent and thus must change as a function of time, except in the exponential case. How then can there be a single, summary hazard ratio for two different (non exponential) survival curves? Is there an agreed upon comparison time, say the median for each? Thank you so much for the explanation, so easy to understand, gonna share it with the whole team. Bless you! could you please tell me how to calculate CI from HR & P value in an published article? it should be noted that i havnt any data about participants in this study. ci IS .25 TO .53 tHEN WHERE IS THE 47 TO 72% COME FROM? What does a hazard ratio of 1.75 mean? May I commend the clarity in which you have presented Hazard Ratio. Thank you, thank you, thank you for explaining these complex stats so well. In case anyone is looking for a quick and easy way to calculate a hazard ratio, HR p-value and confidence intervals, I found this free tool: https://www.gigacalculator.com/calculators/hazard-ratio-calculator.php . Real easy to use as well, just copy & paste from a spreadsheet.